Tens of thousands of people gathered in the city of Krakow on Sunday for the state funeral of Polish President Lech Kaczynski and his wife, Maria. The couple and dozens of senior government and military leaders were among 96 people killed in a plane crash eight days ago in western Russia. They were on their way to the Katyn forest to mark the 70th anniversary of the massacre of 22,000 Polish officers and intellectuals by Soviet secret police. The service began with a Roman Catholic mass at St. Mary's Basilica, a 13th-century church set on a vast market square in Krakow's Old Town. 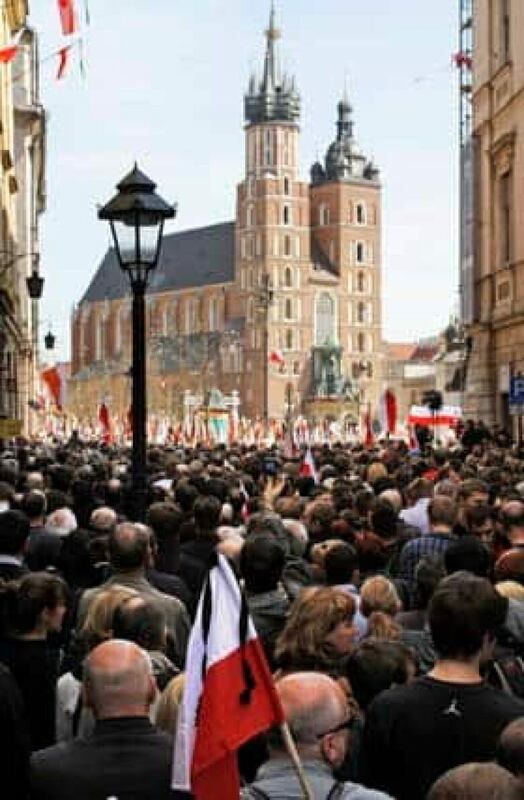 Many in the crowd that stood quietly under a sunny sky in the medieval square carried Polish flags decorated with black ribbons as the service was broadcast outside. Afterwards, the flag-draped coffins of Kaczynski and his wife were borne in a procession down Grodzka Street to the 1,000-year-old Wawel Cathedral for burial alongside the nation's kings and heroes, marking the first time a president will be entombed at the national shrine overlooking the Vistula River. Earlier in the day, the bodies of the couple were driven slowly through Warsaw past places linked to Kaczynski's life, including city hall, where he served as mayor of Warsaw, and a museum he championed that is dedicated to the Warsaw Uprising of 1944. Many dignitaries and world leaders, including Prime Minister Stephen Harper, U.S. President Barack Obama and Prince Charles, were unable to attend the state funeral because of the cloud of volcanic ash from Iceland that has closed airspace over much of Europe for the past four days. French President Nicolas Sarkozy and German Chancellor Angela Merkel also cancelled their trips at the last minute because of the ash, which is dangerous to airplane engines. But several leaders from the Baltics and Balkans came to Krakow by car. Russian President Dmitry Medvedev flew in from Moscow. His presence was a further sign of the warming ties between the two countries, which had been strained for centuries, most recently because of communism and the 1940 Katyn massacre. Last week's plane crash also claimed several notable Poles, including Anna Walentynowicz, a leader of the Solidarity freedom movement; Gen. Tadeusz Buk, the commander of Poland's land forces; Janusz Kurtyka, the head of the state-run historical institute which investigates communist-era crimes; and Janusz Kochanowski, the civil rights commissioner.